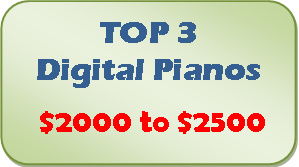 🎹 UPDATED REVIEW - March 20, 2019 - TOP 3 BEST DIGITAL PIANOS for 2019! $500 to $1000, $1000 to $1500, $1500 to $2000, $2000 to $2500, $2500 to $3000, $3000 to $3500, $3500 to $4000, $4000 to $5000, $5000 to $6000, and Top 3 digital grand pianos. 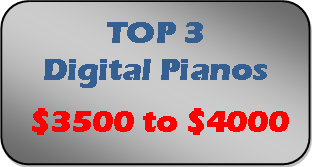 After years of reviewing new digital pianos and watching market and digital piano buying trends, especially in the USA along with talking with thousands of digital piano owners and shoppers, I can say with some authority based on my personal experience that there are definite top selling digital pianos out there in various prices ranges this year. 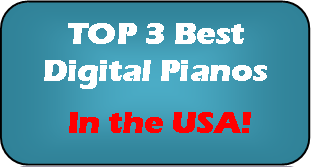 This review and report is on the Top 3 Digital Pianos in America USA that are in a variety of price ranges and this review will give you important information on which new 2019 digital pianos you should seriously consider purchasing for yourself, depending on your budget and musical goals. Be aware there are a number of digital pianos out there with lots of "bells & whistles." While having a bunch of different features and functions can be useful and fun for some people, in this review and report I am mostly concentrating on digital pianos that focus more on the actual piano playing experience for authenticity and more organic realism as opposed to all the extra stuff that are on other models. 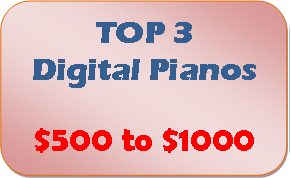 However, there are a couple of pianos below which rank very high not only for offering a very good piano playing experience, but they also have many useful and enjoyable "bells & whistles" that I like very much, so they on this list too. This review is what I consider not only to be on the most popular instruments overall, but also how they rate for "the best bang for the buck" in every price range when it comes to a more authentic piano playing experience. 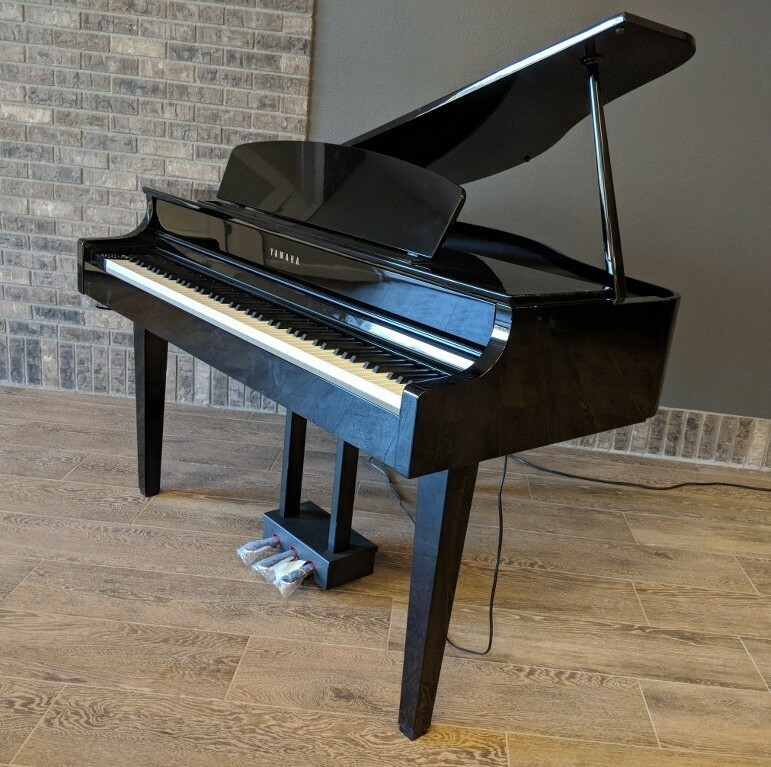 The focus here is mostly on the furniture cabinet digital pianos, but there are a couple of portable models included here as well just because they do a better job in producing a great piano playing experience in their price rage than a competitive full furniture cabinet digital piano. 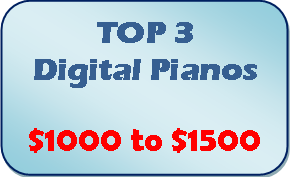 Just to be clear, there are other nice options out there in terms of new digital pianos that are not on this list and I would consider them to be good choices as well and I can share that info with you if you ask me. However, there are only so many digital pianos that can fit into these lists of "3," so just because you don't see one you may be interested in does not mean that it may not be a suitable choice for your needs. Also, it's good to be aware that there are other digital piano brands out there, especially in the USA, that are not acceptable and poorly made so you need to be careful of those digital pianos. 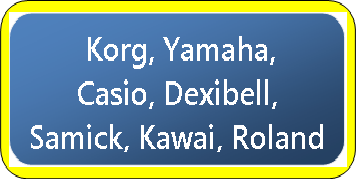 The 7 acceptable brands right now are (in no particular order) Yamaha, Kawai, Roland, Korg, Casio, Samick, and Dexibell and I can also help you with getting lower prices than internet, Amazon, or store prices so don't buy anything, anywhere until you check with me first! It's interesting to note that there is a unique category of digital pianos which are all about the "baby grand" style grand piano shaped instrument. 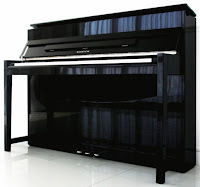 Many piano shoppers and music enthusiasts love the look of a grand piano and in the world of digital pianos, some of the manufacturers do produce these types of products. There is a very small version called the "micro-grand" which measures approx 28" to 32" deep, then there is the small mini-grand which measures between 36" (3 feet) deep to about 45" deep, the regular size mini-grand which measures 48" (4 feet deep) to about 58" deep, and then finally the full size baby grand cabinet which measures approx 60" (5 feet) deep to 5'5" deep. Roland and Kawai are the only top manufacturers who produce a full size digital baby grand (5 feet deep and over), Yamaha and Samick are the only manufacturers who produce and regular size 4' deep mini baby grand, Roland & Yamaha are the only top manufacturers who produce a small mini baby grand, and Samick is the only top brand who produces a micro sized baby grand (2'6" deep). The "micro sized" cabinet design is pretty cool because it's still very attractive and for its small size it still sounds great and has lots of useful higher quality features too. The entire cabinet can fit into a small footprint in a room or home with limited space which is very compelling because there are a lot of smaller homes, apartments, or rooms that have limited options in terms of where the piano would go but yet people still want that "look" of a small baby grand along with big sound and great features. The Samick piano company definitely offers something in that way that the other big guys don't do. 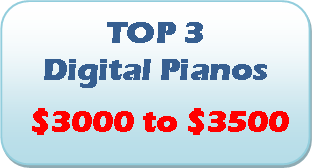 Check out my lists of baby grand digital pianos near the bottom of the Top 3 digital piano review list. Finally, the "off brands" out there that generally play and sound like toys or are very artificial in different ways are not ranked in this review because of their inability to sound and play like real pianos. I call these types of brands and/or models a "PSO," otherwise known as a Piano Shaped Object. Please stay away from these PSO brands if you want a digital piano that will play more like a real piano, will last lots of years, and that you can enjoy without finally realizing one day that you made a big mistake with your purchase. Based on all my personal playing experience over many years with all these digital pianos, some of PSO's include the brands Williams, Suzuki, Artesia, Kurzweil, Adams, GEWA, and a few others. 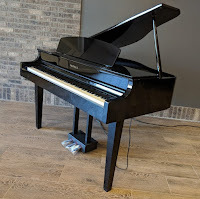 *At $1499 internet price the brand new Yamaha YDP164 is definitely worth mentioning (comes in at #4 in this price range) as it replaces the prior model YDP163 and has a much better acoustic piano sound, although I was not able to list this model in the Top 3 in this price range. It's still a very good digital piano but the other models here beat it out in my opinion. Nevertheless, Yamaha is still an excellent choice and something you should consider. 3. 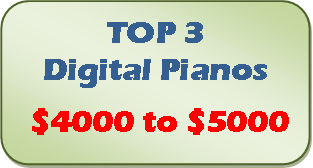 Roland HP601 - Unlike many of the other digital pianos on this list, Roland does not publish its discount prices on-line so you would need to go to an actual piano store that sells Roland pianos to get a price that you could buy it at there. However, based on my experience with this model, the average selling price in Roland piano stores across the country is approx $2300-$2400 plus local tax. The HP601 is the 1st model in the Roland HP line of home digital pianos. With just 28 watts of total internal power going through just two smaller speakers, this piano is definitely on the low end of bigger fuller sound with most of the others being at a minimum of 60 watts total power going through 2, 4, or 6 speakers. However, given that the piano sound chip is really quite sophisticated on this model and the key action and pedaling moves and responds very well, I do recommend the HP601in this price range. Although I have not reviewed this particular model yet, I have played it a number of times and do like it. I should have my review up soon but in the meantime please go to the following link at the Roland factory website to learn more about this piano. I can also help you with getting a lower price (like I can with the other pianos here) if you decide you want one. Roland HP601 product info. My review of this model is coming soon. 2. Roland HP605 - At approx $3500 store discount price for matte finish cabinet (approx $4000 for polished ebony), this piano is one of Roland's most popular higher end digital pianos because it has a better speaker system than the entry model HP603 (so the sound is richer & fuller) and has a slightly taller, more robust cabinet along with a better piano sound. Check out my detailed review of this model at the following link: Roland HP605 Review. UPDATE: The HP605 has now been replaced with the new and improved LX705 for 2019. My review of this model is coming soon. 3. 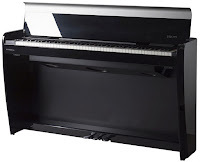 Roland LX7 - At approx $4999 store discount price for a matte finish cabinet and approx $5500 for a polished ebony cabinet, this higher end Roland digital piano looks more like a traditional acoustic upright piano along with offering a very satisfying piano playing experience. This is one of my favorite Roland home piano models and I like what it does for the money. However, if it were my choice in this price range, although Roland is an excellent company, I would personally go for the Yamaha CSP170 because it comes with a bigger, better internal sound system along with way more useful technology in a very nice cabinet for less money than this Roland. However, I would encourage you to read my review on this Roland LX7 digital piano at the following link: Roland LX7 Review. UPDATE: The LX7 has now been replaced by the new and improved LX706 for 2019. My review of this model is coming soon. 3. 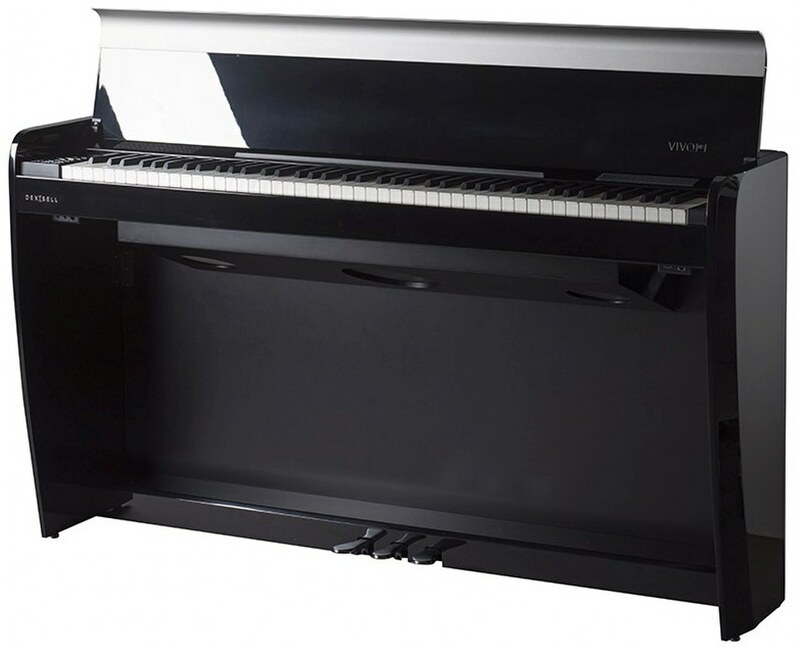 Roland LX17 - The Roland LX17 is currently the best upright style home digital piano that Roland produces. 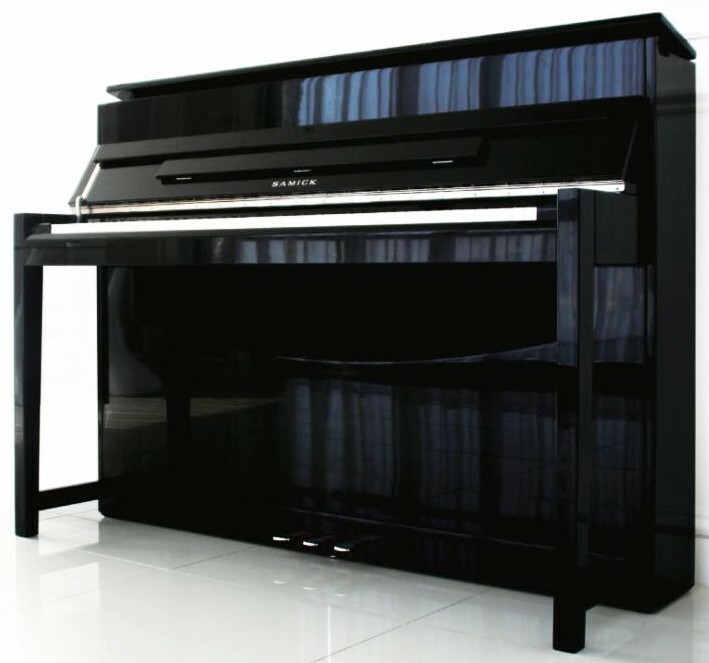 It has all the same technology, key action, and piano sound chip as the models below it, but the LX17 has an upgraded polished ebony cabinet (polished white is optional for a bit more money) with a much more powerful internal sound system that makes it sound like baby grand piano. Although the retail price of this model is a bit over $7000, most Roland piano stores in the USA discount the price to about $6000 plus local tax. Please read my full review of this model at the following link: Roland LX17 Review. UPDATE: The LX17 has now been replaced by the new and improved LX708 for 2019. My review of this model is coming soon. 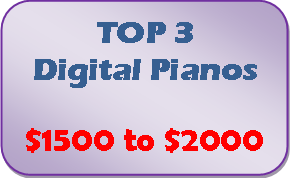 * Whatever you decide that you might like, please let me know and contact me before you purchase anything anywhere because I can give you personal advice and help you save even more money on any of these digital pianos!